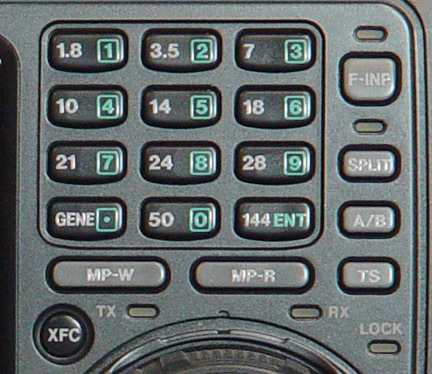 The Icom IC-746 covers 160-10 meters plus 6 and 2 meters. 100 Watts of output is available on all bands - HF, 50 MHz and 144 MHz, making the IC-746 a practical choice for all-around base station use. The die-cast aluminum chassis and a large cooling fan help to stabilize the PA circuit, providing 100% full duty cycle operation. It has 100 alphanumeric memories, spectrum display, Twin PBT, CTCSS encode/decode, APF, two stage preamp, keypad entry, automatic antenna tuner and electronic keyer. DSP digitally transposes receive audio components in all modes of operation to produce desired AF frequency characteristics at the IF stage of the transceiver. This built-in DSP provides: noise reduction, automatic notch filter and selectable APF. The digital bar graph meter displays ALC, power output and SWR simultaneously! The radio automatically selects from the three separate antenna inputs (HF, 6 meters, 2 meters). A built-in automatic antenna tuner operates on the HF bands plus 6 meters. The rear panel has three antenna jacks. The 746 requires 12 VDC at 20 Amps. The IC-746 comes with HM-36 hand mic, spare fuses, DC power cable and key plug. 11.3 x 4.8 x 12.5 inches. 20 lbs.